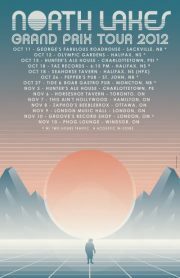 Charlottetown rockers, North Lakes have recently released their anticipated sophomore album, Grand Prix, after their debut album, Cobra, which was the winner of Best Alternative album of 2011 Music PEI Award. Despite the award-winning effort of their previous work, they've bravely undergone some changes in the band formation, (they've shed to 5 piece from 6 piece band) and channeled towards a difference direction by softening their tone towards raw pop , rather than bluesy rock n roll tunes that you can find in the debut album. The result is Grand Prix. The new album, Grand Prix was produced by Paper Lions' Colin Buchanan and it is coated with a vigorous 60's garage rock. This single, Baptism In Burgundy, epitomizes their ability to craft impulsive melody lines with illustrative lyrics, which radiates the vivacious energy of the five members. Give it a listen! North Lakes is playing at Horseshoe Tavern for free on Tuesday, November 6th.